This question is for me and gardenvt. 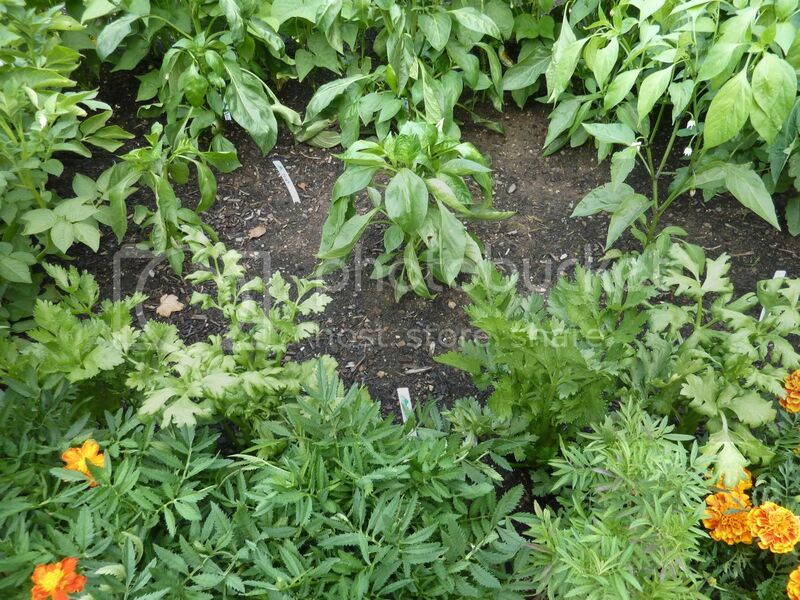 Please take a look at the four celery plants in the first picture (above the marigolds). The ones on the left look good, but the ones on the right donÃ¢â‚¬â„¢t (closer picture of just 2 plants below that). Although, scroll down to the 3rd pic, and you will see a close up of the actual celery part, and it looks okay. At first, I thought it was lack of water, but thatÃ¢â‚¬â„¢s not it. They have been like this for a couple of weeks now. They are growing, but the leaves just donÃ¢â‚¬â„¢t look good, but the celery underneath look okay. Should I spray it with something? Does it mean the celery is actually bad? What do I do about it? Also, even though the celery isn't full grown yet, can I cut off one of the stalks to use it right now for my potato salad? Or should I wait? 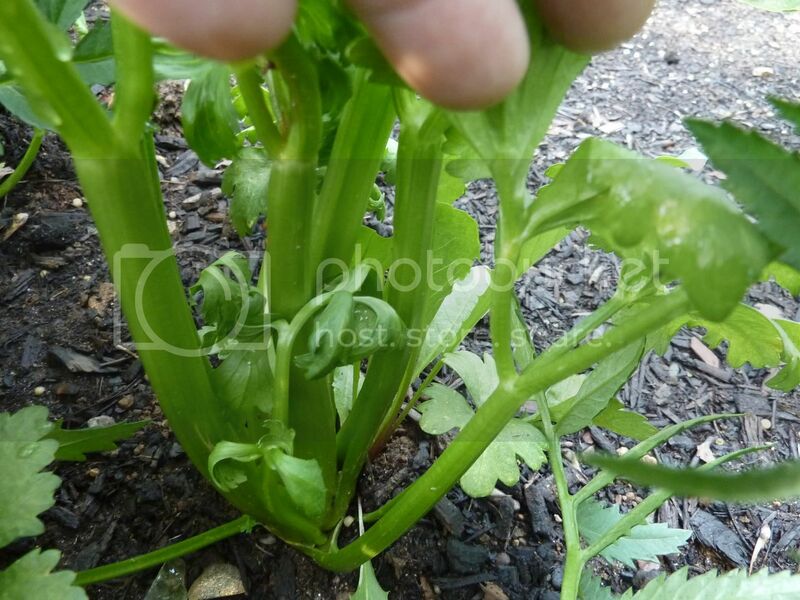 Celery is one of the plants that grows like a giant bush in my yard. I always pick off a stem or two as they are growing. As long as you leave the inner stems it shouldn't be a problem. On a plan your size, I'd only pull off one. The leaves look okay to me, but they might be a little light in color. Try a little bit of fertilizer. Yes, definitely pick off celery stems as you go along. No need to wait to harvest a whole bunch at one time. Through all our heat and drought, celery, surprisingly enough, is one of the things that is doing best in my garden this year. Nothing seems to eat it. I have some planted in full sun in my community garden and some planted in pretty dense shade at home and it is all doing great. Could become one of my new favorite things to grow! Does anyone else have an idea what the leaves look like they are dying? Even though the plant seems to be doing fine? Or maybe the plant just dies slowly? I can't find any other responses on this. 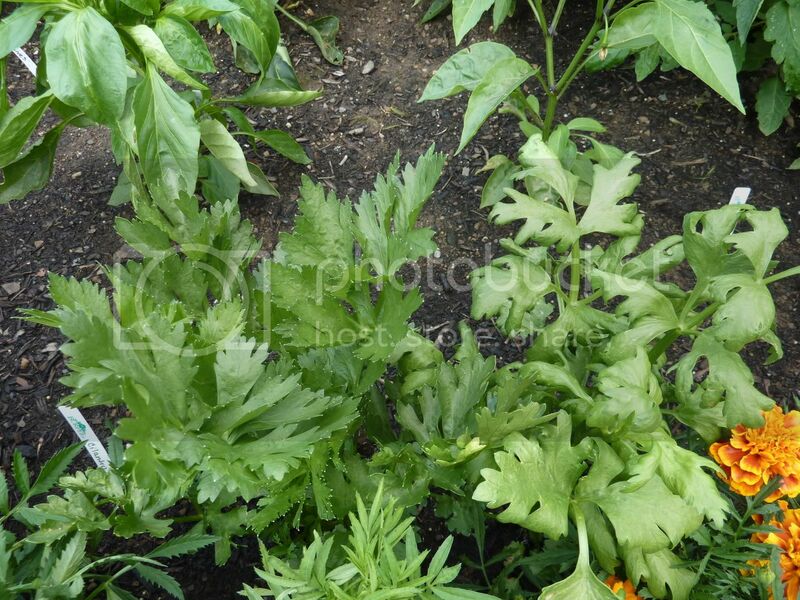 Do you think the celery is safe to eat even though the leaves don't look good? I haven't had a chance to try fertilizer yet. I don't really know why one of your plants is wilting and the other isn't, but I can't imagine anything that would make it not safe to eat. It is not necessarily dying, just struggling a bit. They are planted very close together and everything in your bed there looks a bit crowded. Maybe it's just getting out-competed a bit. no a sprench. Its more than a spray but less then a drench, use enouph water to hit the surface layer of roots and get complete foliar coverage. We call this a sprench. I have two (of celery plants that looked like the photo SLC posted. Interestingly, we both have basil planted near/with the celery. I looked up the leaf issue online and found three possibilities; aphids, leafminer, leaf tier. I think the problem is aphids based on the photos of the plants. I think it is just fine to eat, SLC. I hope you haven't pulled it.